Train to become a driving instructor with the BEST! ​All these benefits and much more are available when you train with ALBA driving school! Become an Approved Driving Instructor (ADI) you will first need to apply to join the Driving Standards Agency (DSA) Potential Driving Instructor (PDI) Register (the Register). You will then have to pass the three parts of the qualifying examination to become an ADI. Being an ADI involves more than teaching someone to drive a vehicle. You will be responsible for developing a high standard of driving behaviour among new drivers, many of whom are young and inexperienced. A career as an ADI is very demanding, but can also be very rewarding. The job requires patience and understanding, and the ability to get on with people. The DVSA uses the Criminal Records Bureau for obtaining criminal record checks of people in England and Wales, and Disclosure Scotland for people in Scotland. You will have to pass all three parts of the qualifying examination to become an ADI. After passing part one, you have two years in which to complete and pass the remaining two parts. You must apply for registration as an ADI within 12 months of passing the final part of the qualifying examination. The qualifying process is not easy. Failure to pass both practical exams within the two-year period, or not applying for ADI registration within 12 months of passing the final exam, will mean starting the process again from the beginning. If you are looking for a new Career, new prospects or just a new challenge. Call ALBA now. I started my driving instructor training with RED driving school plus with other local driving schools but I could see myself getting nowhere so I decided to keep looking elsewhere. I was talking to a friend of mine and he recommended me ALBA Driving School. I decided to call ALBA and arranged to meet Blenti to discuss part 3 training and franchise options. My main worry was whether I was going pass my part 3 test and also if I was going to get enough work. 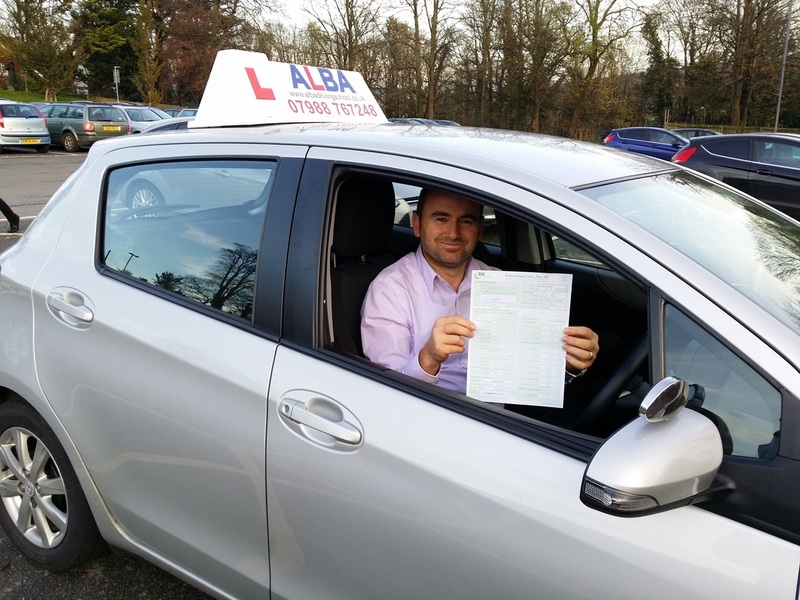 I decided to join ALBA on a PINK licence and do my part three training with Blenti who himself passed the ADI part three on the first attempt years ago. I enjoyed the training with ALBA. Work was unexpected I had to put some learners on waiting list to give me time to focus with my ADI training. I passed my ADI part 3 on the first attempt what else can I say THE RESULTS SAYS IT ALL. If you are looking to become a driving instructor I strongly advice you to call ALBA.